Several years ago, I fell in love with the look of mercury glass. I love to decorate with it all year round, but at Christmastime, it's especially fun. I spent the whole of Friday decorating for Christmas and decided to group all my mercury glass together. There's just something about it grouped and sitting atop my blue vintage dresser. Here's an interesting story. Both of my sisters were helping me decorate on Friday. As we gathered my mercury glass, we found I was lacking one piece to make it look complete. No problem, we thought. We'll all go shopping and find something to add to this. About an hour later, the mail came. With the mail, was a package from Shannon at Fox Hollow Cottage. I had won her giveaway. Well, a very sweet angel made of mercury glass! Can you believe it? Not only was Shannon's giveaway perfect, but apparently she has perfect timing as well! Do you think maybe I should raise her up a little? 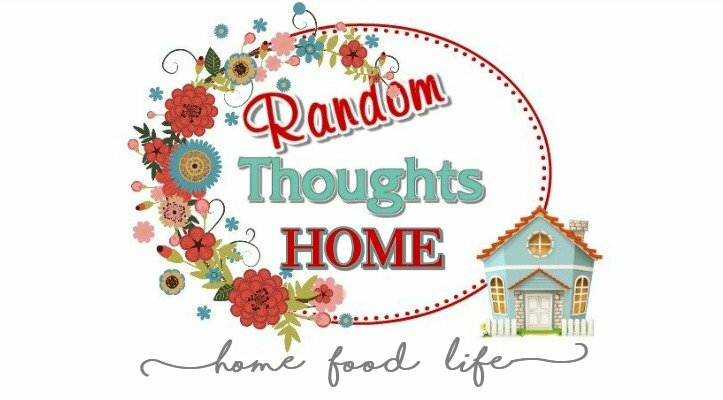 Anyway, can I just say if you haven't checked out Shannon's blog, Fox Hollow Cottage yet, you won't be disappointed when you do. Shannon decorates beautifully and she has a lively personality you'll enjoy. OK, I'll be back to share more of my Christmas decor with you soon. Your display is beautiful. The angel is perfect in her place. I checked out Shannon's blog. She is from the PacNWest as well. Very nice. Thanks for introducing her. Gorgeous Gina, I love your antique table too. Just lovely and ever so sparkly. I love Shannon's blog too, she is a sweety! I had no idea of what that was called ~ but I love it!!!! Great display. 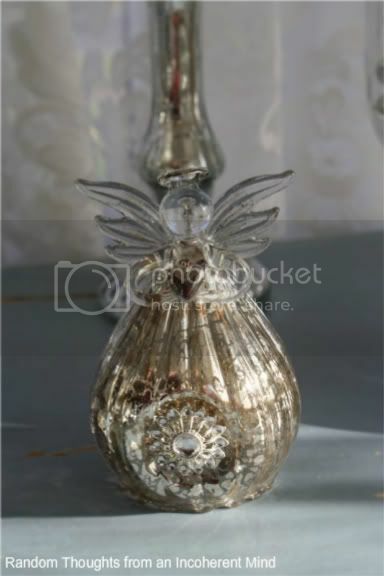 All of your mercury glass pieces are gorgeous, and the angel is a great addition. I'm off to check out her blog. 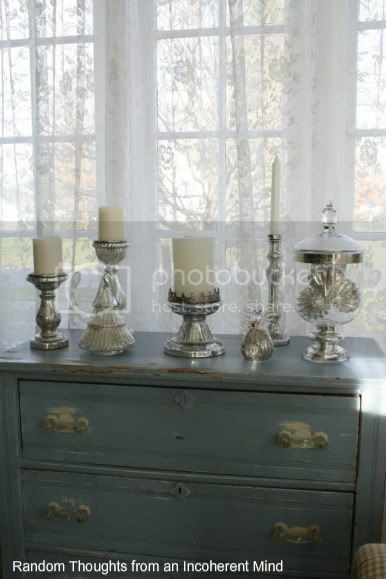 I love the mercury glass on the blue dresser, very pretty and eye catching! 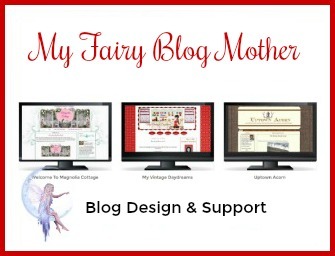 I'll have to stop by Shannon's blog! Your display of the Mercury glass is Gorgeous. 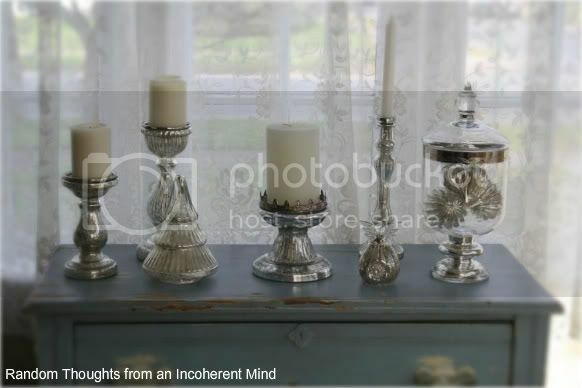 I love the way you have put it all together on your antique table. I would like to thank you so much for your sweet comments on my Christmas Tablescape, hope you have a great week sweet lady. Gina, talk about perfect timing!! Your mercury glass looks great! I love Shannon's blog, as well! She is so much fun! Thanks for sharing; and have a great day! You mercury glass collection is beautiful! Nice win too! Love your collection and love where you have placed it. That angel is beautiful. What great timing. One of those "moments" that make you wonder. I just love mercury glass! You have a beautiful display! BTW, you've never forgotten my name:) But I should've added my signature a long time ago, I'm so terrible at figuring those things out!!! Oh great is that! 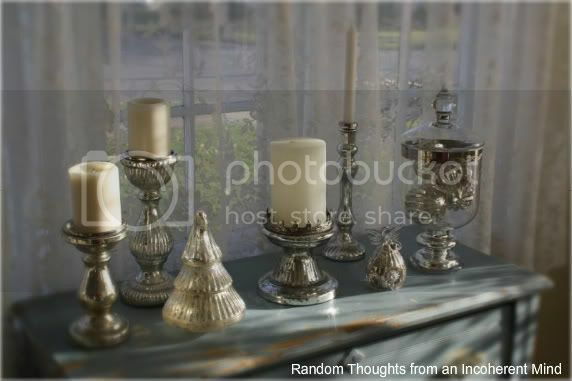 I don't have any mercury glass but I love it and certainly I love it even more on top of that beautiful vintage dresser! Parfait! Congrats on your win! I love mercury glass too. Your collection is so pretty. Looks perfect sitting on top of the vintage piece. Really pretty display. Isn't it amazing how great it works to group like things together? I'll make sure to visit Shannon's blog...lovely giveaway. Sure wish I had my decorating finished. Oh well! I'm sure it will get done. It looks beautiful all grouped together Gina. It creates more of an impact. Love mercury glass too although I don't own a single piece...yet...Hopefully my hubby will get my hints this year for Christmas. Hee, hee, hee. Sending you a great big hug. *nice* Gina! I love mercury glass, too. I saw some gorgeous pieces in Pottery Barn. Proceeds from some of the candles there benefit St. Jude Children's hospital. I did not buy any, but they sure are pretty! I love your little angel. She fits right in with your collection! Wow, how weird is that an angel sent an angel just when you were looking for one!!! Divine intervention! I think she looks great as she is, I wouldn't raise her, unless you want to LOL! I was grouping my mercury glass too. It looks so beautiful on the blue dresser! It is so widely available now. I just love it. Mercury glass is perfection: it sparkles, yet it's warm looking. This is gorgeous! I could swipe a piece or two....you wouldn't notice, would you? Beautiful~ I love mercury glass too! Thanks for sharing at Feathered Nest Friday!